This version is all new and much more full! It really gives you the feel of what Artistic Worship can look like. Pastor Lynn talks in the introduction about how you can do this type of worship in your own church. 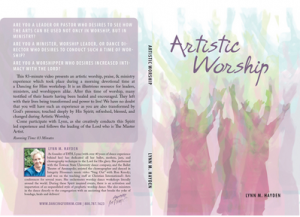 Are you a leader or Pastor who desires to see how the arts can be used not only in worship, but in ministry? Are you a minister, worship leader, or dance director who desires to conduct such a time of worship? Are you a worshipper who desires increased intimacy with the Lord? This 83-minute video presents an artistic worship, praise, & ministry experience which took place during a morning devotional time at a Dancing for Him Worship Dance Conference. It is an illustrious resource for leaders, ministers, and worshippers alike. After this time of worship, many testified of their hearts having been healed and encouraged. You’ll see how this leads to ministry with many people receiving the baptism in the Holy Spirit. They left with their lives transformed and power to live! We have no doubt that you will have such an experience as you are also transformed by God’s presence; touched deeply by His Spirit; refreshed, blessed, and changed during Artistic Worship. This demonstrates a tapestry of worship that becomes a sweet smelling savor to our Lord. Come participate with Lynn, as she creatively conducts this Spirit led experience and follows the leading of the Lord, who is The Master Artist. On this page, is a brief clip. Check it out! Want to learn some of the types of expressive movements seen on this DVD? Then be sure to get the “Expressive Worship & Sign I” DVD as well!